Premium conference phone ideal for small and medium-sized rooms. Incl. 2 additional microphones. 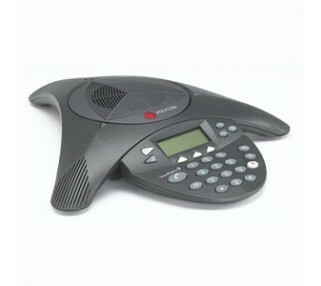 Rent this Polycom for two-way conversation between your meeting room and a remote location. This full duplex conference phone means that both ends of the meeting can speak and listen at the same, allowing for free flowing conversation. ideal for small and medium-sized rooms with a limited number of participants. Compatible with analog phone systems and digital phone systems (with included adapter). The two additional microphones come with 6' cables to extend the microphone coverage up to 12' total.